You'll need to be a Hunter to pull this off, since the Bladedancer's super is the only way to stay in the air this long, but here you go. 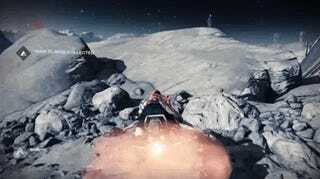 People can jump the Hellmouth on the moon. If you haven't played the game, that's a big jump. You can even do it without a Sparrow if you get the timing right. And just to reiterate: you need to be a Hunter. Titans need not apply.